To restore individual files and folders from file systems other than Microsoft Windows, you can use the multi-OS File-Level Restore wizard. To restore files from VM guest OS, Veeam Backup & Replication uses a helper appliance. The helper appliance is a helper VM running a stripped down Linux kernel that has a minimal set of components. The appliance is quite small — around 50 MB. It requires 1024 MB RAM and takes around 10 seconds to boot. 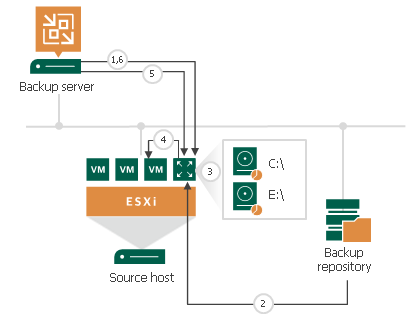 Veeam Backup & Replication deploys a helper appliance on the ESX(i) host in the virtual infrastructure. Veeam Backup & Replication mounts disks of the VM from the backup or replica to the helper appliance. The backup file or VM replica itself remains in the read-only state on the backup repository or datastore. Veeam Backup & Replication launches the Veeam Backup browser where mounted VM disks are displayed. You can browse the VM guest file system in the Veeam Backup Browser and restore files or folders to the original VM or to another location. Alternatively, you can enable an FTP server on the virtual appliance and allow VM owners to restore files themselves. When the restore process is finished or the Veeam Backup browser is closed by timeout, Veeam Backup & Replication unmounts the content of the backup file or replica from the helper appliance and unregisters the helper appliance on the ESX(i) host.